Sanskrit name Heera ( हीर ) means diamond, thunderbolt, string of pearls or lion. in Punjabi, Hindi, Urdu and Bengali Heera ( हीरा ) also means diamond. Feminine Heera is another name for Laksmi. Heera Rajagopal is a former Indian film actress. She has appeared in several Tamil, Malayalam, Telugu, Kannada and Hindi films. Pandit Hiralal Shastri was an Indian politician and the first chief minister of Rajasthan state in northern India. Heera Panna is a 1973 Hindi film. Written, produced and directed by Dev Anand for Navketan films, the film stars Dev Anand, Zeenat Aman, Raakhee, Rehman, Jeevan, A.K. Hangal, Paintal and Dheeraj Kumar. Ojasvat means strong, energetic. This is a Sanskrit name can..
Bengali form of Devdan. 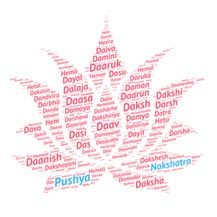 Devdan means "gift of the gods" from..
Bhaskara means Shining, glittering, hero, gold. Derived from.. Ancient Sanskrit word Japya (Sanskrit जप्य) literally means ..
Sanskrit word Ashma literally means made of stone or hard as..
Mahakali literally translated as Great Kali, is a Hindu Godd..
Sanskrit meaning of name Madhugni is Like a fountain nectar,..